MAXIS PATCH FIXED THE PROBLEM! The latest patch for OFB and FFS fixes the problem of locked tiles. If you install the patch, you will no longer need this hack, simply delete the file from your Downloads folder. This fix is for Open for Business only. 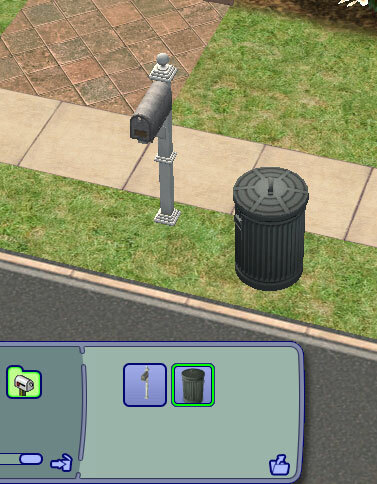 It allows you to move and place a mailbox and a trash can within 2-tile wide area of a lot along the road. By default that area is locked and you get “out of bound” message if you try to place anything in there. Place wind_OFBmailboxtrashcanfix.package file into Downloads folder. Place wind_OFBmailboxtrashcancollection.package file into My Documents\EA Games\The Sims 2\Collections folder. Note, if you already have any other collection with mailbox and trashcan, you can just use that one instead and skip this file. Collection files do not require expansion packs. To uninstall simply remove the files. HOW TO USE. When you load a lot, activate moveobjects on cheat code. Delete the mailbox or the trashcan and pick them again from a collection in the game catalog. Install them where you want along the road. Deactivate the cheat code – moveobjects off. You only need to install from the collection once. Next time you need to move the same mailbox, just activate the cheat code. If the mailbox was replaced it takes several days before the mailman shows up. I tested this fix with pay-at-box hack and it works fine. Cannot guarantee compatibility with all the other mailbox hacks. Unlike my OFB locked tiles fix, this fix affects only the mailbox and the trashcan, less things to go wrong. *UPDATE Apr 24/06* Added community collection file as requested. Useful when you convert community lots to residential. See this post below for explanation.